I am lucky to be resident of a state which has one of the most active Microsoft user groups … and these great guys frequently arrange super great seminars, presentations, camps and other events. I happen to participate in many of those events whenever possible. I think it is always a great idea to take part in those events as they give you first hand experience of MSFT technologies, and more importantly you learn from the people who are the best at what they do like MVPs and other tech Experts. And most of all, its like one day training of different topics from industry experts for FREE !!! By 29th of this month (this Saturday), CTDOTNET (the most active .NET user group of CT) is gonna arrange an event called SharePoint Saturday. I guess, it will be first of its kind event. It will be a whole day event where people from different industries working on SharePoint will present on different topics, which are generally classified as Developer, Administrator and End Users. They still have some seats left… if you want to attend this great event then you might still have chance. As RSVP is required, you can register at this site. Just checked their site, as of today they are HOUSE FULL !! I am sure it’s going to be exciting (1/27). As first step, download demo of SharePoint Server 2010 from official Microsoft site. And then run the installer. 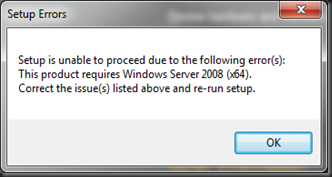 With surprise you will be greeted with error saying that you need to have Windows Server 2008 (x64)with SP1. Means that as a minimum system rec. 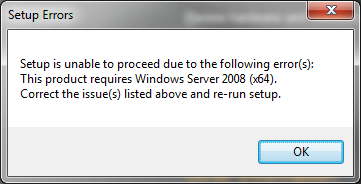 you need to have 64bit edition of Windows Server 2008. Which I don’t have… So I did little “Googling” and with no surprise there were lots of people were complaining about this rec. (mostly people like me who just want to try SharePoint ) … and I stumbled across my fav. Site (the Code Project) where someone had posted a solution to this problem.